One of the best things about being on the Mississippi Gulf Coast is the proximity of our beautiful barrier islands teaming with wildlife, warm beaches, and hundreds of years of history. The Inn has teamed up with Captain Matthew Mayfield—a local, nationally-trained chef who shares his love for the Mississippi Sound and the Gulf of Mexico not only with his customers at his restaurant, Tay’s BBQ in Pascagoula, but with patrons eager to explore the waters just to the South. Captain Matt of Island Trace! Island Trace Charter & Guide Service offers five different experiences for a variety of ways to enjoy our Mississippi Sound and Gulf waters. Whether you are an experienced fishermen, a simple sight-seer, or an avowed landlubber, we invite you to experience a part of the Mississippi Gulf Coast that promises to offer an unforgettable experience in the great outdoors. Explore the Mississippi Sound, (the body of water between shore and the barrier islands), and the Gulf of Mexico just south of our barrier islands with Captain Mayfield…pack a lunch, slather on some sunscreen, grab your hat and sunglasses, and bon voyage! If you’re looking to try your hand at reeling in a beautiful dolphin fish such as this one, we recommend the offshore fishing experience for exploring the waters and wildlife south of the barrier islands. Let Capt. Mayfield give you a new definition for “Deep South” with exciting game fish such as snapper, Cobia, and King fish. 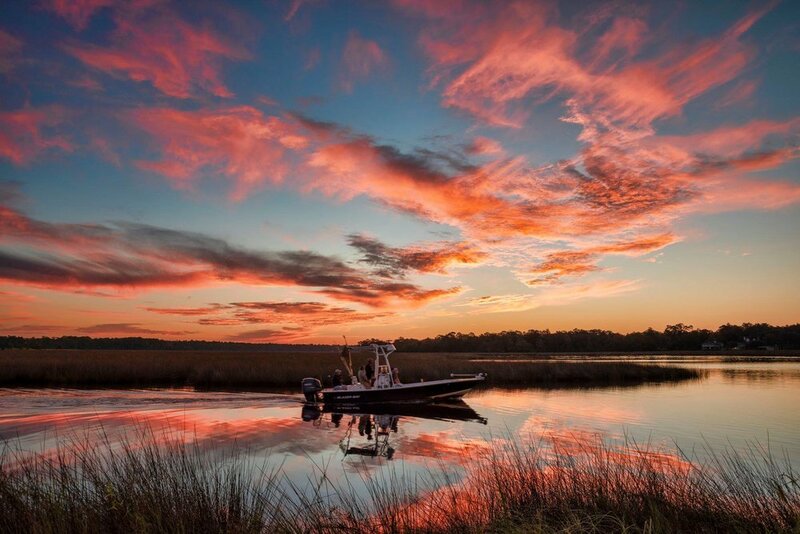 Head out into the marshes of Davis Bayou, Weeks Bayou, or any of the surrounding inland water areas for local delicacies such as speckled trout, redfish, flounder, and sheephead. Maybe even spot an American alligator lurking in the marsh! Pack your sunscreen, and head out to the islands for the day with Captain Matt! Horn Island was the natural inspiration for Walter Anderson’s water color masterpieces. Get some inspiration of your own on this beautiful barrier island with white sand beaches and gorgeous Gulf water on the south side of the island. Follow the shrimp boats coming in from the Mississippi Sound to catch sights of bottle-nosed dolphins playing in the wave or watch ospreys soaring above the water and diving for fish. Bring the family along for a trip filled with education and fun in the sun! To book your next adventure with Island Trace Charter, give us a call at The Inn, and we will set up your next Mississippi Gulf Coast adventure!